Well, this is getting a little weird. It looks like we're gonna have a trend of early access screenings for films now. I'm not sure of the connection, but Amazon Prime members can see Aquaman on December 15th instead of the 21st. Look through the site if your a member for the offer. Amonz Prime did it last year for that awful Jumanji movie. 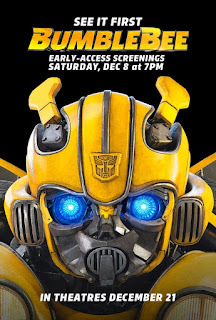 And now, Bumblebee has a special early screening day with a little toy as a gift on Dec 8. That's free to everyone to sign up for.